Since my son was diagnosed with PDD-NOS (aka “atypical autism”) and Sensory Processing Disorder, I’ve had a tough time figuring out suitable toys and games to get him. Sure, he’s happy with just about the same stuff any other kid is – blocks, mind-numbing, battery-powered toys, ride-on toys, etc. But I know that a lot of the things we have don’t always meet his needs for educational play. So I wanted to write this blog post to make a list of a few of the toys that have either a) worked for us or b) seem like promising acquisitions. If you’re also shopping for a toddler with SID/SPD, PDD-NOS, or other spectrum symptoms, I hope this list will come in handy. I’ve also added a small list of stocking stuffer ideas at the bottom of the post. Please note, however, this disclaimer: I am not a doctor and can not assure that these toys will work for your kid. This is one of the hot toys of the season, and it’s no surprise why. It combines two things that kids love: TV and exercise. The idea of the Smart Cycle is that kids learn from playing games that are controlled by the pedaling kid hooked up to the TV via interactive audio-video outputs. I don’t advocate just popping your kid in front of the TV for hours at a time, but sometimes moms need a break. 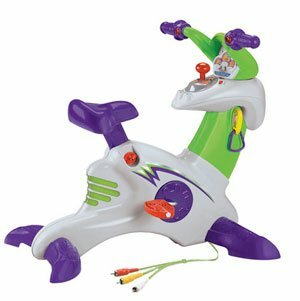 I like the Smart Cycle for my sensory kid because he hasn’t mastered the gross motor skills of balance of pedaling, and this will allow him to learn those skills safely and warmly inside our home. Past occupational therapy experience has also taught me that my son is really revved up to learn during or shortly after being physically active. By the way, the “Extreme” version of this toy has “rumble action,” which may be even better for a sensory-seeking child. Last summer when we were on home leave, Dante made excellent progress with vocabulary and speech by using Blooming Kids. This software is geared toward kids on the spectrum and has, at this writing, 37 programs which teach kids new vocab, social cues, telling time, and tons of other things. The drawback to Blooming Kids is also its asset – nothing to unwrap on Christmas Day. But you can download the software onto your PC or Mac, install, and be ready to go with new software in just a few minutes. If your kid likes those toy laptops but is not really learning anything from them, you may enjoy Blooming Kids because you control what and how your kid learns. It is helpful to use this software on a computer that has a touch screen or you can get a wireless mouse, which also helps with fine motor skills. Yes, this is an item from the adult sporting goods shop, but the Urban Rebounder is an excellent exerciser for your tireless kid. Anytime Dante is feeling a bit out of sorts – running around in circles in the room, seeming bored, wanting to go to the park but it’s pouring rain – we tell him to go bounce on the trampoline. This particular model is helpful because it has the handle, allowing kids with balance problems to hold on a little tighter and the legs also fold down to make for easy storage – if you want to store it. My son will jump on this for 10-15-30-minutes at a time non-stop. But when he is done, he seems a bit more focused. I get in on the action by singing “Jumpy Jump Jump Jump Jump” from Yo Gabba Gabba while he bounces and we all have a good laugh. 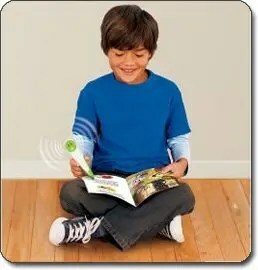 I’ve been checking out all sorts of kids learn-to-read devices and this one seems the most helpful and least annoying. My three year old loves books and has really learned to read – and spell! – a lot of words. But I also know that when I read to him, he doesn’t so much focus on the words as the cadence. A lot of children’s books are so sing-songy that it’s easy to memorize the sound of them and not the words within. For better or for worse, this Leapfrog wand takes the melodiousness out of reading – the friendly, computerized voice is monotone. But it does let you read word to word, holding memory for up to 10 books at a time. Leapfrog Tag currently works with 30 books (that cost extra but at about the same price as a regular storybook), and there are phonics books as well as ones that feature licensed characters (Dora, Star Wars, etc.) Kids can further interact with their books by going online and collecting rewards by playing games associated with the books. As far as stocking stuffers, I have several suggestions: mini-massager (my son loves the extra vibration input); Moon Sand and Play Doh; motorized toothbrush; koosh ball; exercise ball (good for balancing and bouncing); Melissa & Doug Wooden Sandwich Making Set. Have you seen other toys that you think would benefit a sensory kid? Please let me know by commenting below! You should take part in a contest for one of the finest sites on the web. I will highly recommend this web site!